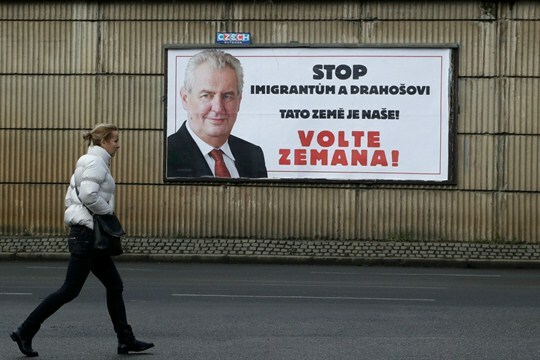 A woman walks past a poster for Czech presidential candidate Milos Zeman that reads, “Stop migrants and Drahos. This is our land! Vote Zeman!”, Prague, Jan. 24, 2018 (AP photo by Petr David Josek). PRAGUE—Czechs re-elected populist firebrand Milos Zeman in the second round of presidential elections late last week, in a race widely viewed as a referendum on the Czech Republic’s geopolitical orientation. Despite the return of Zeman to Prague Castle, from where he has railed against migrants and Islam, called for a referendum on the Czech Republic’s membership in the European Union and reached out to Russia and China, Czech foreign policy will nevertheless likely remain anchored in the country’s position as an EU and NATO member. While Zeman’s bluster attracts international headlines and enrages critics, the president’s influence on policy is limited.